The site now under construction across Lexington Circle from World Gym in Peachtree City will be the site of the 80,000 sq. ft. headquarters of Peachtree City-based logistics technology company SMC3. Rendering/Jefferson Browne Gresham Architects. Efforts that will lead to the construction of the new headquarters for Peachtree City-based transportation technology company SMC3 (Southern Motor Carriers Association) on Lexington Circle are underway. Completion of the 80,000 sq. ft. office building is expected in March 2020. 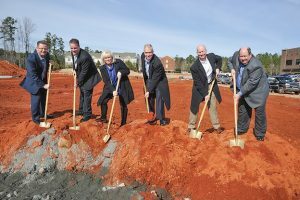 On Jan. 30, the final day of the Jump Start 2019 supply chain conference in Atlanta, SMC3 staff, members of the board and President and CEO Andrew Slusher broke ground on the transportation technology company’s future headquarters in Peachtree City. Company officials said completion is scheduled for March 2020. With an 87-year history, and with offices currently located on Westpark Drive, SMC3 is a nonprofit corporation and is the leading less-than-truckload (LTL) data and solutions provider to help optimize LTL freight. The 3-story headquarters will include up to 80,000 sq. ft. The building will feature a curved facade of mostly glass, with brick and gray slate, Tennessee field stone and metal panels in colors of copper or zinc. The new headquarters, designed by Jefferson Browne Gresham Architects and built by South-Tree Enterprises, will include a three-story atrium, smart glass, acoustical metal decks to improve sound absorption and extensive natural lighting. The broad expanses of windows are broken up with stone pilasters. The curved building facade is further accentuated with a cantilevered open-frame awning projected from the roof, Browne said in July 2018 when the project was approved by the Peachtree City Planning Commission. Present at the Jan. 30 groundbreaking for the new SMC3 headquarters in Peachtree City were, from left, Chief Financial Officer Tom Monheim, Chief Information Officer David Knight, Vice President of Human Resources Ruth Reynolds, President and CEO Andrew Slusher, Chief Commercial Officer Brian Thompson and Senior Vice President of Operations and Data David Walker. Photo/Mike Gibson. SMC3 representative Jon Ross said SMC3 in the past five years has experienced tremendous gains in both its employee and customer bases. The company now counts more than 130 employees in its Peachtree City and Louisville, Kentucky locations. During that time, SMC3 has introduced a number of game-changing solutions, base rates and analytical tools that help clients optimize the LTL portions of their supply chains. The new headquarters building will allow SMC3 to continue this growth, Ross said. Ross said SMC3’s continuous innovation and authority in LTL rating and transit time solutions is the result of decades of expertise in the transportation arena. With its range of logistics and supply chain solutions that integrate seamlessly into current business systems, SMC3 supports customers’ needs as they grow, whether they’re dealing with 10 shipments or 10,000 shipments per day, Ross said. Headquartered in Peachtree City, SMC3 also has offices in Louisville, Kentucky, and Rockville, Maryland.